Lovebirds are very social and form deep bonds with their owners. If you are short on time to spend with your lovebird, then it is best to get him or her a companion. There are several species of lovebirds, such as the genus Agapornis. But the most commonly found species in the pet trade include peach faced lovebirds, or Agapornis roseicollis, masked lovebirds (Agapornis personata) and Fischer's lovebirds (Agapornis fischeri). There are many color mutations found in peach faced lovebirds and several mutations in some of the other species, so there are many color variations of lovebirds available. Lovebirds are small, compact parrots about 5-6 inches in length and can live up to 15 years or more. Very active, curious, and playful, lovebirds pack a lot of personality into a small package. They are also feisty little birds. They are very social and form deep bonds with their owners and are sometimes very cuddly birds, but their intense personalities can also make them prone to nipping and territorial aggressiveness and jealousy. Hand-raised babies make the best pets. Some experts believe that females are more prone to jealousy and territoriality than males. Hand-raised babies definitely make the best pets. Still, regular handling and training are needed to maintain a tame lovebird (so a hand raised baby that hasn't been handled much as it gets older may be hard to hand tame again). If getting an older lovebird try to find one that was hand raised and has been handled regularly and has some training. Older lovebirds that are not hand tamed may require a great deal of patience for taming. 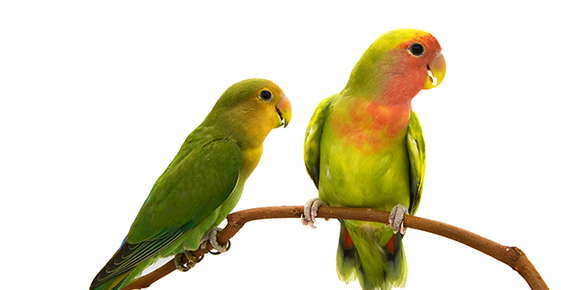 A common myth about keeping lovebirds is that they should always be kept in pairs. If you have more than one lovebird they may become more deeply bonded to each other that to you. A single lovebird will do well, as long as it gets the social interaction, contact, affection, and attention that it needs from its human family members. If you are short on time to spend with your lovebird, then it is best to get him or her a companion, though. While not as loud as some larger parrots, lovebirds can produce a loud high pitched screech, especially if looking for your attention. Their normal chirps and squawks are not overly loud, but they do like to chatter. As a general rule, they are not known for their ability to mimic speech or sounds, although there are exceptions. Some say females are more apt to mimic sounds or speech than males. As a bare minimum, I would recommend a cage at least 2 feet wide by 2 feet long (and 2 feet tall), but a larger cage is definitely better (with the length being relatively more important than the height). Bars should be no more than 1/2 to 5/8 inches apart, and should be oriented horizontally to allow the birds climb the sides of the cage. Avoid round cages. Provide a variety of perch sizes (including natural branches if possible) as this is healthier for a caged bird's feet. Lovebirds should be fed a variety of foods. A good pellet diet can form the basis of the diet, supplemented by a variety of fresh foods and some seeds (seeds should make up less than 25 percent of the total diet). A cuttlebone can be provided for extra calcium. Lovebirds are quite aggressive chewers, which must be kept in mind when choosing toys. Make sure there are no small parts that can be chewed off and ingested, and no clips, loose strings, or other parts in which your bird could get its beak, feet, or head trapped. Safe toys include wood, sisal, leather, acrylic, and rawhide toys (including hanging toys as long as they are not long enough to strangle your bird), bells, and ladders. As well, household items such as the cardboard tubes from paper towel rolls, paper cups, ink-free cardboard, and dried pasta shapes may also be used by your lovebird. Lovebirds are very active and playful so it is a good idea to have lots of toys on hand to rotate through the cage to keep them occupied. All toys including their hanging devices should be zinc and lead free. Cotton ropes are good too, but may be best used only under supervision since threads can come loose and entangle birds easily.